Baldwin-led clinic to help broaden Pinoy coaches' knowledge of international game. FORMER Gilas Pilipinas coach Tab Baldwin leads the cast of renowned international coaches who will be sharing their wealth of knowledge and experience in the World Hoops Clinic from June 16 to 18 at the Marikina Sports Center. Joining the current head coach of the Ateneo Blue Eagles in the three-day clinic, open to all coaches from all levels, are Natxo Lezcano, Nenad Vucinic, and Pero Cameron, all experienced coaches in the international scene. 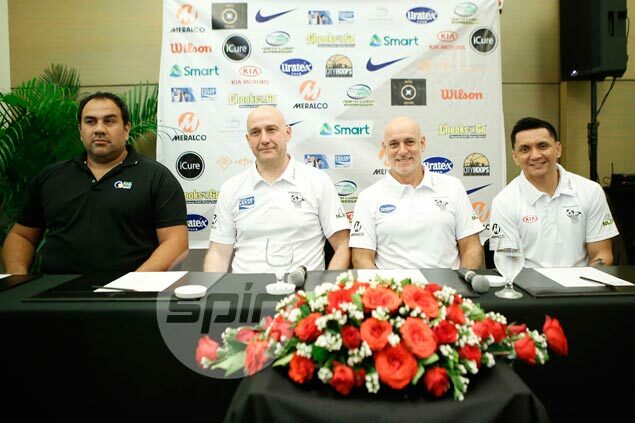 Lezcano, a former head coach of the Ivory Coast national team, was once a consultant of Gilas Pilipinas while Vucinic was a former national coach of New Zealand and is currently an assistant coach for a club team in Lebanon. Cameron, meanwhile, is an assistant coach of the New Zealand national team who once played for Baldwin for the Tall Blacks during his playing career. Also joining the clinic are Alaska head coach Alex Compton and Gilas Pilipinas assistant coach Jimmy Alapag. Baldwin said the clinic was organized in order for Filipino coaches to be accustomed to the international game, particularly the European style of play, in which the emphasis is on player development, skill development, and team play. "We have to break out of our myopic view of basketball as an American sport," said Baldwin during Wednesday's press conference at the Discovery Suites. "In my opinion, the evolution of the sport, tactically, is European. In Europe, to compete on the world stage, you can only do it through player development, skill development, and team play." "It's going to try to achieve broadening our coaches' knowledge about thinking differently or at least being exposed to a different kind of coaching." Lezcano will discuss the free offense and ball screen defense, while Vucinic will touch on the pick and roll offense and combo defenses. Cameron, on the other hand, will give coaching tips on undersized big men and the art of positional rebounding, as Baldwin will talk about fundamental elements of player development and set play design using basic offensive elements. Compton will tackle pressure defense, and Alapag will talk about leadership. Baldwin also thanked fellow coaches Jay Salvador and John Flores for making the event possible. "They were the brainchild of the idea for the clinic. We are extremely excited to be doing what we are doing this week," Baldwin said. The program is affiliated by the MVP Sports Foundation and is supported by iCure, Uratex, Chooks to Go, NLEX, Meralco, Discovery Hote and Resorts, Wilson, City Hoops Manila, KIA, Gameville Sports Wear, and Pocari Sweat.